Well, Eugene has been here just over three weeks now. He is settling in very nicely, gaining back the weight he lost when he was lost and endearing himself to everyone in the house. Last week our little neighbor, Anita, came over. She is almost as cute as Eugene and she loves him too. Sometimes too much. The day Anita was here it rained, so we played inside. Eugene and Nelle tried to hide were sleeping in a box of socks, but Anita found them woke them up. Anita took all the socks out of the box much to the horror excitement of Nelle and Eugene. Penny tried to get in on the game and found she was too big for the box. "stay in the box". Penny and Nelle looked on in horror with great amusement. In the end, only Penny was left. She was blamed for messing up the socks. Too fun! That box looks like a drawer. 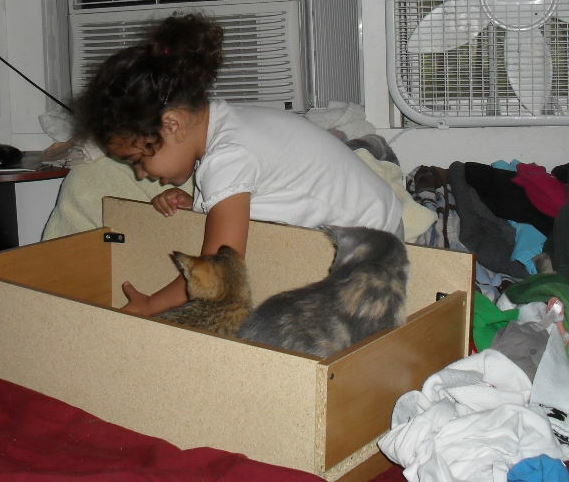 If the kittens had opposable thumbs they might have closed Anita in the box. They could have blamed that on Penny, too. We just finished off the basement bedroom, and in turn, closed off the access to the other side of the basement for the cat. I may have to make him a cat door.